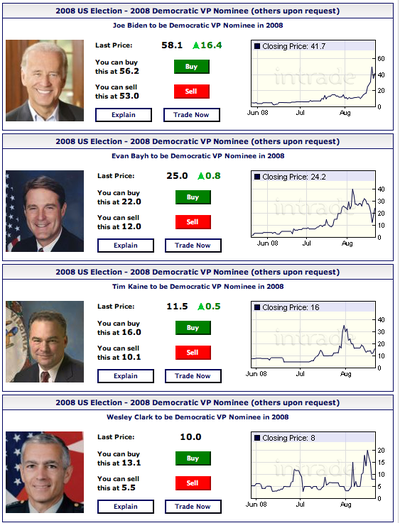 We all know that Intrade Political Futures got the Joe Biden pick right last week -- how well did it do with the GOP pick? As it turns out, not so good. THEY COMPLETELY MISSED THE VEEP PICK. Not just off by a little, mind you, but off a ginormous amount. As we have previously suggested, the political futures markets are essentially poll aggregators. There is very little wisdom amongst the crowd, other than looking at Rasmussen, Gallup, Roper, WSJ/NBC, NYT/CBS, etc. and taking a very rough average. 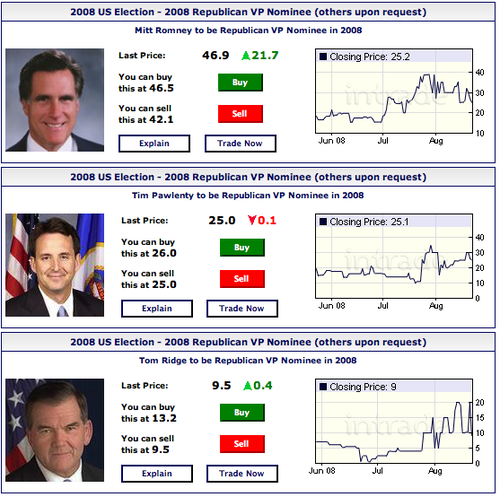 Just look at how the Palin VP futures Traded only yesterday: You could have bought her VP futures for 4 cents on the dollar! Some wisdom! Note that her lifetime futures chart is only 3 months old. Forget 18 months ago -- as of 4 months ago, SHE WASN'T EVEN ON THE FUTURES TRADER'S RADAR. Over the life of the contract, she was never more 20%. Note that this is not merely a case of the longshot coming in -- Palin was not polling well, so the aggregators did not pay her much attention! That's a, truly, inspired pick. She's a good example, from the little I know, of what's right in this 'Country'. Personally, I didn't think the GOP had it in them.